I've been kind of quiet here the last few days as I've pulled together my quadrennial 'fearless picks and predictions' of the track and field events of these Olympic Games. This tome is over forty pages now and tomorrow's previews are queued up and ready to go. The men's discus will get these Games underway at 9:30am local time. It is done in spite of the exasperation of my hotel having lost internet connectivity at the height of my work on the preview - for 36 hours. Yowza! My blood pressure is fine now - no, really. You can see my tweets even if you don't subscribe to twitter. Just go to their website and plug in @trackerati and you can see my communications there. Some of you may have seen my 'Grim Reaper' tweet a couple of days ago. There is more in that pic than meets the eye. Notice the badge hanging around my neck? After an application process that lasted four months - and a week into my stay here - I was issued a pass to the Rio Media Center. This gets me into a great place to work, a place where numerous press conferences are held, and best of all, a place where I mingle with journalists from around the world. To be clear, this is neither an all-access (royal blood required) nor single-sport pass, both of which are quite hard to come by (Track and Field News, the publication of record in international track, gets one sport specific pass per Olympics). One of the great hangout places on the planet. Food trucks and picnic area outside the Rio Media Center. Word went out that the media centers were under supplied - little liquid and less food. Circle the wagons! 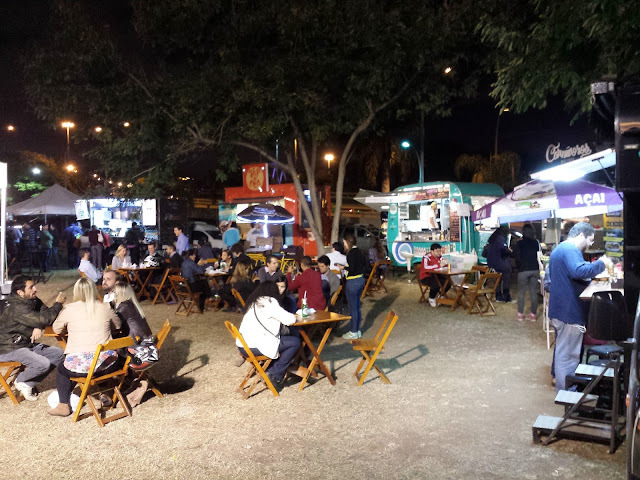 Enterprising food truck operators flocked to the two media centers and no one has gone hungry since. Tonight a gracious couple, Patricia and Sidney, who are Cariocas - Rio residents - made room for me at their table and we hung out for a good - no, a great - half hour. She works in insurance security and he with a prominent energy company. They could not have been more welcoming - or funnier! We truly did have the best time. Thank you, Patricia and Sidney, for such a gezellig evening! Yes, we discussed language, among many other things. Oddly, finishing the previews frees me up to do a greater variety of writing, even though track starts on Friday. 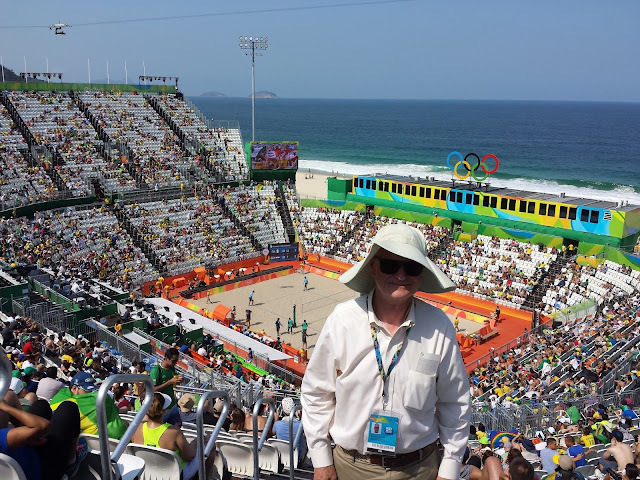 I am eager to get a post up about the beach volleyball I attended, as I lucked into a historic match on the women's side when the Egyptian women's team played. I'll get that posted this weekend. The press pass came about, in the end, in a rather funny way. After months of the most picayune picking apart of my application, I knew we had it down to the last possible detail. One last submission and... I waited. And waited. Again. For two more days. In the meantime, I had met Heloisa Pinto. I wrote them a rather cheeky message and said, "While awaiting your reply, I wrote a story about meeting the "Girl from Ipanema" - thought you might enjoy it." And sent them the link. I had the pass 2 hrs, 44 minutes, and 42 seconds later. Three years and two days after I started this blog. No sooner had I pressed 'post' than I received an email message from Track and Field News. That men's discus at 9:30 tomorrow morning? I'll be covering it for them.